Ditchingham was that rare thing in 19th Century East Anglia, an Anglo-Catholic hotspot. The parish sits in the Waveney Valley on the Suffolk border, and, perhaps mindful of their puritan credentials, rural people in the east of England were highly suspicious of the new ritualist ideas emanating from Oxford in the 1830s and 1840s. 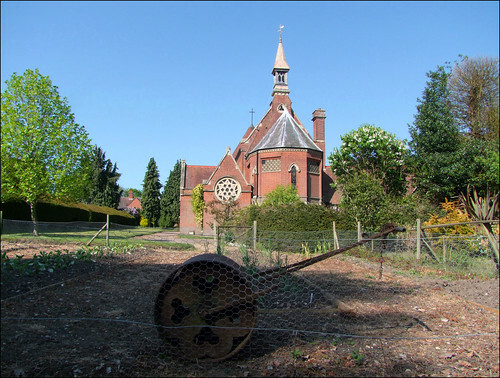 Enthusiasm for Anglo-Catholicism in East Anglia was limited: a few churches in Norwich, the antics of George Drury at Claydon and Akenham in Suffolk, and that was about it. Walsingham was still nearly a century away from taking part in the Great Revival of sacramentalism. But here, on the outskirts of Bungay, two families caught a burning brand from the wildfire beginning to spread through the Anglican church. They were the Sucklings of Barsham and the Crosses of Shipmeadow, two adjacent parishes on the Suffolk side of the border. With the help of their not inconsiderable resources, the Bungay area became East Anglia's main centre of Anglo-Catholicism. One of the features of Anglo-Catholicism which the stout-hearted protestant peasants of Norfolk and Suffolk found hardest to stomach was the establishing of religious communities. These groups of Anglican men and women set apart and living consecrated lives were frowned upon not only by the press of the day, but by the Diocese of Norwich itself. In fact, religious communities were, by the 1850s, a familiar feature of the English landscape - but they were Catholic, of course, not Anglican. They had usually been established by groups fleeing France during the terror of the Revolution half a century earlier. The Catholic Sisters and Brothers were generally received with sympathy, since the people of England warmed to revolution even less than they did to Catholicism. But Anglican religious communities were considered a step too far. When Father George Drury established a convent at Claydon on the outskirts of Ipswich, he was accused by the Ipswich newspapers of keeping a harem, an outrageous slur in mid-Victorian England. Similarly, when the Suckling and Crosse families helped establish an Anglican Community of the Sisters of Mercy at Shipmeadow in the 1850s, there was outrage. However, the community benefited from the sheltering support of the two main local landed families, something poor George Drury never had. Indeed, the founder of the community was one of the Crosse daughters, Lavinia Crosse, and in 1858 the community began to establish itself in the adjacent parish of Ditchingham, on the Norfolk side of the border. They called themselves the Community of All Hallows, and their first achievement was to open a home for fallen women, which usually meant young girls who'd had babies outside of marriage. This building, and the convent which began to grow around it, were the work of Henry Woodyer. An orphanage followed, and by 1883 Kelly's Directory for Norfolk could note that the House of Mercy, opened in 1859, in conjunction with the Church Penitentiary Association, is under the care of the sisterhood of All Hallows, and has for its object the reception of women of unchaste lives, from all parts of England; the house is a large cruciform building with a beautiful chapel in the head of the cross; it can receive 30 penitents; warden, Rev. E. P. Williams; treasurer, Sister Catherine Rotch; Miss Lavinia Cross, lady superior. All Hallows Home, founded in 1867, is an orphanage for girls of the better classes who have fallen into reduced circumstances; they are admitted at any age above 3 and under 10, with the understanding that they remain in the Home until after confirmation; the house will hold 30 orphans; respectable girls of the lower classes are also received into the Home for industrial training as domestic servants. All Hallows Country Hospital is capable of holding 20 patients, who may be admitted without restriction from any practicable distance, at a small weekly payment; incurables, convalescents and lady patients are also received at an increased charge. These institutions are under the care of the same Sisters. In later years the sisters would open a large school, the buildings of which are to the east. They now form the Belsey Bridge Conference Centre, managed by an Anglican Trust. The modern chapel there houses Alan Oldfield's fabulous mural Revelations of Divine Love. However, the work they are best known for today is managing the All Hallows hospital down in Bungay itself. Here, we are barely two miles from the bustle of that pretty little town, but there is a feeling of great remoteness about the Convent and its chapel. The chapel, of 1865, is a grand gothic statement something in the French style, with a bell turret and a projecting apse. In the 1950s, JP Chaplin added a fabulous rotunda with a conical roof at the west end which appears to be in the style of a baptistery or chapter house, but which I think was intended as an entrance porch. Above the doorway is a relief of the Waters of Life pouring out into what might have been a traditional doom scene, representing the power of salvation. Inside, the furnishings are much more traditional, dating back to the late 19th Century. Behind an ornate gothic reredos, there is a narrow lancet at the east end, the glass depicting Christ in Majesty. The chapel is set in delightful, secretive grounds, the low folding hills of the Waveney Valley enclosing woodlands and fields about. The convent buildings are to the north and west of the chapel, and this is still one of the largest religious houses in the Anglican communion. The vegetable gardens to the east are bordered by a high hedge, and beyond it is the moving sight of the sisters' graveyard, a beautiful spot just to stand and ponder for a while.